Until making homemade nougat, nougat was a mystery to me. Nougat was the alien chewy substance found in my least favorite candy bars. A request to make Milky Way cupcakes (more on that in a future post) prompted me to research nougat and ultimately to make some myself. I learned that while nougat traditionally is a candy prepared with nuts (per Wikipedia: “The word nougat comes from Occitan pan nogat (Occitan pronunciation: [panuˈɣat]), which means nutbread.”), the nougat in Milky Way contains no nuts – it’s a chocolate malt nougat. It’s made with egg whites (like a meringue), but with the addition of sugar, corn syrup, malted milk powder, and chocolate. Despite my distaste for Milky Way bars (even before I became a chocolate snob, I didn’t like ultra-sweet candy bars), I bought one for research purposes. Like a teen buying condoms, I hoped that I wasn’t spotted by anyone who knew me. Very often, foods that I don’t like become magically delicious when I make them myself. This was not the case with nougat. My homemade nougat was a spot-on match for Milky Way’s nougat – sticky and sickeningly sweet. Do you like Milky Way bars? You’ll love this stuff! Does this mean that I didn’t like the Milky Way cupcakes? Nope. When I mixed the nougat into chocolate malt cupcake batter, the candy’s sweetness harmoniously balanced the not-so-sweet batter. I was thrilled with the results. Give me nougat in a cupcake over nougat on its own any day! 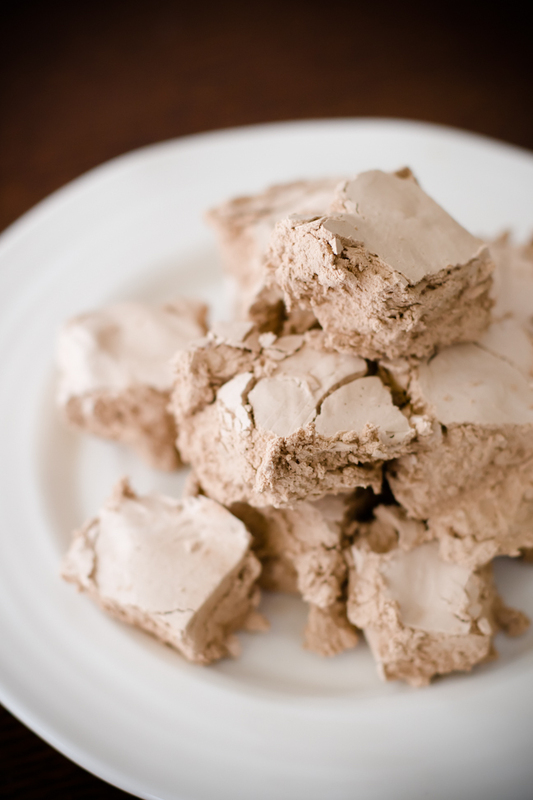 I got the malted milk nougat recipe from Elizabeth LaBau at About.com. I am reprinting it below with a few minor changes and my notes. I wasn't ever a fan of nougat in candy bars, but then I looked into how to make it and was pleasantly surprised. Line an 8x8 pan with parchment. Place the sugar, corn syrup, and water in a medium saucepan over medium-high heat and stir until the sugar dissolves. Brush down the sides of the saucepan with a wet pastry brush to prevent sugar crystals from forming (I skipped this step, but didn't have any problems). Cook without stirring until the temperature on a candy thermometer reaches 260 F. While you wait for the correct temperature, proceed to prepare the rest of the recipe. Chop the chocolate into small pieces and place it in a microwave-safe bowl. Microwave until melted, stirring after every 30 seconds to prevent overheating. Stir until completely smooth, then set aside to cool slightly. Place the egg whites in the clean bowl of a large stand mixer fitted with the whisk attachment. When the syrup reaches 250 F, begin to beat the egg whites on medium speed. Once the sugar syrup reaches 260 F, remove the pan from the heat. Turn the mixer to high speed and slowly stream in the sugar syrup down the side of the bowl. Continue beating on high speed for about 5 minutes, until the egg whites are shiny, white, and stiff. Turn the mixer down and add the melted chocolate, salt, and malted milk powder. Mix until well-combined and smooth. Scrape the nougat into the prepared pan and smooth it into an even layer. Allow it to cool at room temperature until completely set, then cut into small squares to serve (or set aside to use in cupcakes). The nougat can be stored in an airtight container at room temperature for up to a week.